Each day since journalist Jamal Khashoggi walked into the Saudi embassy in Istanbul and disappeared, new evidence suggesting he was murdered by henchmen directed by Crown Prince Mohammed bin Salman emerges. The latest is the announcement from Turkey’s President Erdoğan that furniture in the Saudi consulate was found to be “painted over,” which, he implies, was done to hide signs of the brutal interrogation and dismemberment of the dissident and Washington Post columnist. Calls are mounting for the US government to retaliate, and while President Trump is trying to protect bin Salman by extolling the monarch’s “huge” arms purchases, some members of Congress are calling for investigations and sanctions. Robin Pogrebin and Sopan Deb of the New York Times report that “the ties between nonprofit institutions and the oil kingdoms [such as Saudi Arabia] are extensive and growing.” For example, an exhibition at the Brooklyn Museum, an artist dialogue at the Guggenheim, a seminar at New York’s Metropolitan Museum of Art, and a celebration of Saudi art at the Kennedy Center in Washington, DC are all, reports the newspaper, coordinated by organizations closely tied to or generously funded by the Saudi government. Saudi Arabia even set up its Misk Foundation to spread Saudi culture and advance bin Salman’s image as a reformer and patron of the arts. In the past year alone, Misk has organized shows in the United States and announced plans to open an outpost in Paris. In January, New York’s Museum of Modern Art hosted a news conference to announce a list of programs from Misk. 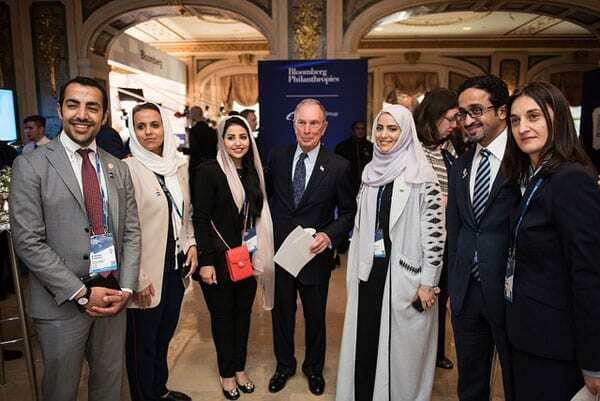 In turn, the country’s King Abdulaziz Center for World Culture has brought representatives of major American museums, including MoMA, Met, Brooklyn Museum, Los Angeles County Museum of Art, and the de Young Museum in San Francisco, to Saudi Arabia. Outside of the world of arts and culture, the Clinton Foundation has accepted at least $10 million from the Saudi government for its global anti-poverty work. At least $1 million more was donated by Friends of Saudi Arabia, co-founded by a Saudi prince. Such connections have rarely been the stuff of news until now. Where will it lead? A Haaretz contributor speculates that “it could lead to an attempt to isolate the Saudi regime and perhaps other allied Gulf autocracies with sanctions that might resemble the BDS (boycotts, divestments, and sanctions) movement that seeks to make Israel a pariah state.” He goes on to conclude, however, that the human rights community is unlikely to bite the hand that feeds it. At the same time, however, nonprofits are equally dependent on their reputation, which can easily be tainted both by misuse of funds and the company they keep. “When it comes to contributor donations, having a good reputation is more important than having a strong brand. Nonprofits can strengthen their reputations by collaborating with other organizations with similar mission,” advises a guide from one fundraising consultant. Perhaps the developments surrounding the disappearance of Khashoggi—not to mention Saudi Arabia’s brutal war on Yemen—should serve as a wake-up call for nonprofits that accept such funding. A compromise could be found by accepting the support but directly condemning the acts. So far, few nonprofits who benefit from Saudi Arabia’s largesse are willing to step up. Daniel Weiss, the Met’s president and chief executive, told the New York Times only that, “We are in process of learning more, and our engagement will reflect additional information.” Does that mean the expected denial of official monarchy involvement will be accepted on its face? The Middle East Institute went a bit further, canceling its participation in an upcoming Saudi-sponsored conference, and issuing a statement saying, “The board calls on the authorities of Saudi Arabia, Turkey and the United States to act swiftly to bring out the truth about what happened to Mr. Khashoggi and to hold accountable those responsible.” Nevertheless, it falls short of directly calling bin Salman to account or offering to refuse further funding.